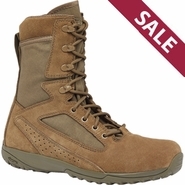 Belleville offers two different United States Marine Corps boot models. Both the 590 and 550 ST are constructed of olive green suede leather and high-abrasion nylon Cordura. 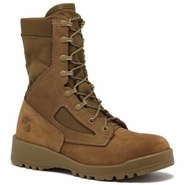 They feature the Marine Corp's famous Globe and Anchor logo stamped on the outside heel of each boot. Both models offer Belleville's patented Vanguard running shoe sole for the ultimate in fit and comfort. Whether you're on a ten mile ruck or training on an obstacle course, these boots are designed to provide maximum comfort and guaranteed to enable you to perform at your highest levels.